It may take some time to determine how the operation went. The Small Carry-On Impactor separated from Japan's Hayabusa2 spacecraft April 4, 2019 (April 5 JST) in order to slam down into asteroid Ryugu. 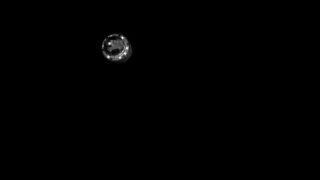 This image was captured by Hayabusa2's optical navigation camera from about 500 meters above Ryugu. "The spacecraft state is normal and it was confirmed that the evacuation operation, the separation of the SCI and DCAM3 went as planned. The SCI separation and evacuation sequence were a success," mission team members wrote on Twitter around 2 a.m. EDT (0600 GMT and 3 p.m. Japan time) today (April 5). An onboard explosive charge was scheduled to detonate last night at 10:36 p.m. EDT (0236 GMT and 11:36 a.m. Japan time this morning), sending the plate hurtling toward Ryugu's boulder-strewn surface at about 4,500 mph (7,240 km/h). But the detonation, and the resulting impact, had not yet been confirmed as of the time of this writing. This procedure wasn't for entertainment — instead, it will help scientists understand Ryugu's interior. The main drama played out over the course of about 40 minutes, from the impactor's deployment to the (presumed) impact itself. But, provided it was successful, the operation will occupy scientists for much longer as they pore over images captured during the procedure. The researchers hope that by watching how debris flies away from the crater, they'll be able to better understand what Ryugu is made of. If all goes well, Hayabusa2 will take a closer look at the crater itself to study the interior of the asteroid, where radiation hasn't affected the rock. The team running the mission even hopes they'll be able to grab a sample of material from this location, to add to the surface sample the probe collected in February. Indeed, Hayabusa2 has been extremely busy during its time at Ryugu. In addition to the sample-collection and SCI activities, the probe has studied the asteroid in detail and released two hopping minirovers and a 22-lb. (10 kg) lander onto the space rock's surface. And Hayabusa2 still has one more tool to deploy: MINERVA-II 2, a third, tiny, hopping rover, similar to those the probe deployed in September. The mission team currently hopes to send MINERVA-II 2 out onto Ryugu's surface late this summer. After that task is complete, all that's left for Hayabusa2 to do is head back to Earth, carrying with it precious souvenirs of the space rock it will have spent a year and a half studying. That sample is scheduled to come down under parachute in December 2020, in a special return capsule.